Audience response systems offer many benefits to those who use it in group settings. Purchasing an audience response system from CLiKAPAD is completely flexible, we are able to supply according to your exact needs. Whether you need 12 keypads or 212 keypads, we can quote for a system to suit. Items can also be purchased individually, so if you need some additional keypads or an extra base station, we can supply those too. Software – our ppvote software works seamlessly within PowerPoint to create voting slides that run directly from your main presentation. With 2 levels of sophistication to choose from we have the right software to suit your requirements. Voting keypads – the CP37 (credit card sized keypad) is perfect for multiple choice voting in a portable credit card sized from factor. Base station – the CLiKAPAD base station is the voting receiver. The base station connects to your laptop via USB and receives voting data from the keypads via radio; no internet or WiFi connection required. Carry cases – keep your system protected from damage using CLiKAPAD custom carry cases. Coaching – online or at your offices, a coaching session will really help you to make the most of your new system. Support subscription – access to assistance from our experienced team of audience response experts, updates to your ppvote software and discounts on additional services such as coaching, rental of additional keypads for your larger events and slide design services. 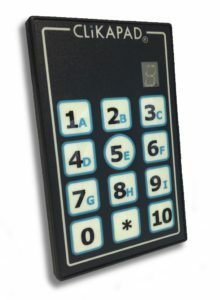 Presenter keypad – allows remote control for your voting presentations. Detector keypad – assists with finding keypads ‘missing’ at the end of your meeting. Sentry – alerts you to keypads being removed from the meeting area to prevent losses. CLiKAPAD is an incredibly versatile tool – click here to see examples of typically uses of our voting system. If you would like to see real world examples please visit our case studies section. For further information, or for an audience response system price quote, please get in touch.